Are you a singleton wanting to meet someone from a different background? Then, Interracial Dating Central might be just the kind of platform for you. One of the more popular interracial dating site, interracialdatingcentral.com ticks in most of the boxes. It offers free as well as paid membership, is easy to join and use, contains many advanced features, and is backed by an efficient customer care team. 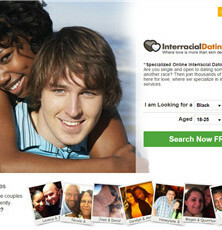 Read our review of interracialdatingcentral.com to know more this online interracial dating platform. Joining InterracialDatingCentral.com is a cinch. Just click at “Join for free” on the site’s homepage and then fill basic information, like your gender, whether you looking for a man or woman, the type of relationship you are interested in (that is, friends, penpal, short-term, or long-term) and your ethnicity. Once you have filled all this information, click the Join Now button. In the next screen, you will be presented the option of joining with Facebook or using an email address and a password. Using your Facebook details to login might be better for those who are ultra-busy, because it’s a faster login. The site, it must be said, doesn’t post on Facebook. In the third screen, you would need to provide basic information about yourself, like your date of birth, location, and a few lines to describe yourself. You would also be asked to pick a nickname for yourself. Once you are done, click the Finish button. The last screen advices you to complete your profile and lists best online dating safety tips. Read the displayed information and then click the Login Now button. The basic membership plan is free. However, it offers only limited features. If you want more, you would need to enroll for a paid membership. The site offers 3 membership plans, 1 month, 3 months, and 6 months. You can pick any of the three as per your needs. There is much value to be gained by joining a paid membership. VIP members, as paid members are referred as on this dating site, enjoy many exclusive features, each gained to improve their experience on the dating site and to help them meet a great person quickly and with utmost ease. As said above, free membership offers limited features, which alone may not be sufficient to spruce up your dating life. Free members can send a flirt, browse through profiles of other members, mark profiles as favorite, read profile write ups, and check out photographs of other members. That’s all they can do. To enjoy other features, they would need a paid membership. VIP members can send as well as receive unlimited email. They can also initiate and receive voice chat. They can check who all have viewed their profile. A VIP member can check who all have favorited his or her profile, unlike a free member, who can only favorite a profile. A face-to-face chat is a great feature. Some members post a profile photo which is not theirs. A webcam chat allays any such fears. It is also more personal than a text chat and so is so much more enjoyable. VIP members are given a priority—and rightly so, because after all they are the ones who pay a fee. As a VIP member, you get to see the profile of the new members first and a chance to send a chat invite to those among the first pick of the new members whom you have found interesting. You have a greater chance of forming a connection with someone who likes your profile. Just as you can favorite others, other members can favorite you. This features allow you to view the names of members who have favorited you, improving your chance of meeting someone special. The customer service of Interracialdatingcentral.com is as good as any of its better competitor’s. You can contact the customer care team via email, phone, or fax. The site also contains an FAQ section containing answers to most common questions that users ask. All in all, interracialdatingcentral.com is a good interracial dating site. Its intuitive user interface ensures you encounter no difficulty while navigating through the site and accessing various features. Thanks to many advanced features the site offers, you can get better results from your online dating efforts. These advanced features also make online dating more fun and enjoyable.